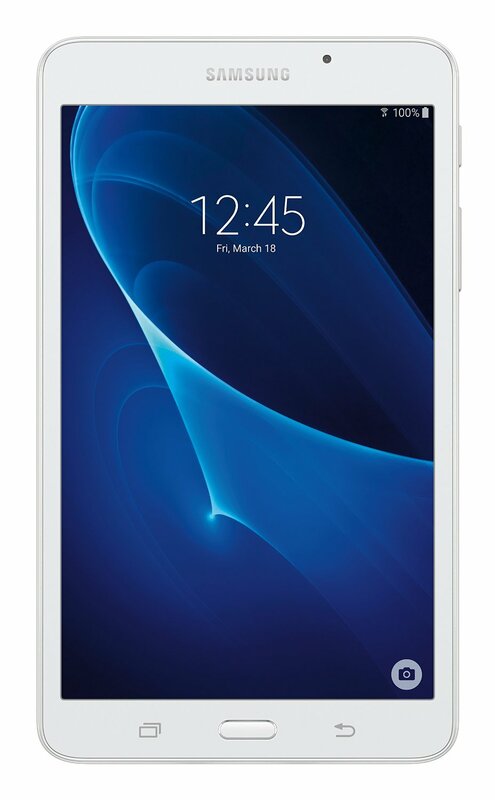 Samsung Galaxy Tab A 7 inch Tablet, White: Play games, surf the Web, and help your children learn with the Samsung Galaxy Tab A. This 7 inch Tablet has a lightweight design and a long-lasting battery, making it easy to take it anywhere. It comes with two cameras for taking photos and videos/movies and a microSD card slot for adding memory. 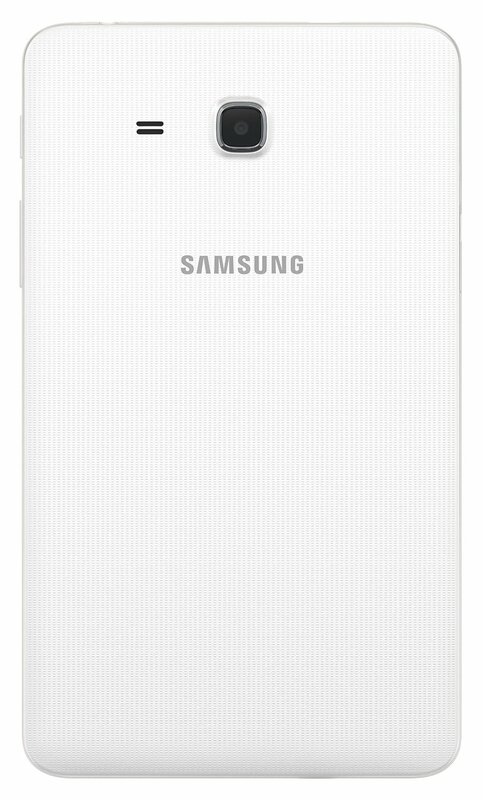 It includes a built-in radio application and access to many others via Samsung Galaxy Essentials. Lightweight, Portable Design: Weighing less than one pound, this slim Tablet feels light and comfortable in your hands, so you can take it with you wherever you go. Its vivid 7 inch display makes it perfect for browsing the web, reading digital books, playing games, streaming your favorite shows, and more. Expandable Memory to save Pictures, Music, and Movies/Videos: The Galaxy Tab A features a microSD card slot, enabling you to easily expand your Tablet’s memory from 8 GB to up to an additional 200 GB with a microSD card (not included). This means more space for your pictures, books, music, and movies/videos. 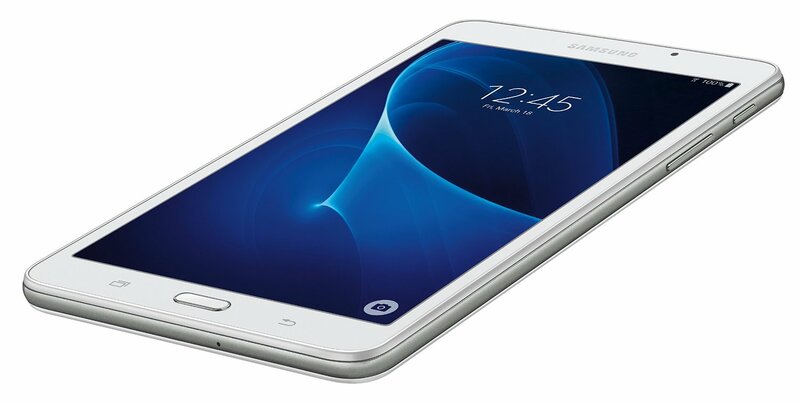 Long-Lasting Battery for Hours of Use: Giving a long battery life of up to 11 hours per charge, the Galaxy Tab A allows you enjoy your favorite activities and applications for longer without having to recharge your Android Tablet. Add Educational Content with Samsung Kids: With a subscription to Samsung Kids, you can provide your kids with interesting educational content on your Galaxy Tab A.
Samsung Kids offers easy-to-use parental controls that let you to set limits on Tablet time, choose app categories, and monitor your kids’ progress. The Samsung Galaxy Tab A includes a free month of Samsung Kids and a starter pack of content. Capture Memories with Dual Built-in Cameras: Designed with a 5-megapixel back camera and a 2-megapixel front camera, the Galaxy Tab A helps you capture better photos and videos with advanced features such as continuous shot and panoramic modes. You can also easily switch between shooting photos and videos. Tune In to FM Radio: The Samsung Galaxy Tab A includes a preloaded radio app, so you can plug in your headphones to listen to your favorite FM stations at home or on the road. And unlike other music apps, you can enjoy the music even when you’re not connected to Wi-Fi. Enjoy Premium Content with Galaxy Essentials: The Samsung Galaxy Essentials widget offers a collection of complimentary apps optimized for your Tablet. To customize your Samsung Galaxy Tab A and instantly expand your entertainment options, simply select and download the applications you need.